Derek’s present remit is the Chief Executive of the £1.3 million purpose built Skatepark and Youth Support Centre within the City, The Factory Skatepark. Previously he has been involved in the financial management of The Gate Church and its related businesses for 18 years and has substantial experience in working in and with the voluntary sector. Derek has been involved in work in rural Uganda since 1993 which has included taking groups to visit and work each year. He has a vision to help resource groups in these types of situations to enable them to help themselves. He also visited Romania on five occasions. Norman was a chemistry teacher at a local high school. After he retired from teaching he worked part time, for several years, at the Skatepark where he was responsible for the monitoring and evaluation of the Youth and Community work as well as being a director of the Skatepark.. 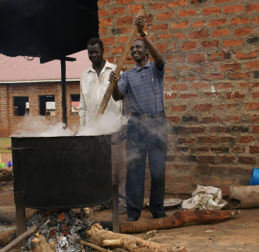 He is an active church member and has visited Uganda on a number of occasions. He is glad to be part of an organisation which supports others so that they in turn can become self sufficient and make a difference in their communities. Capstone Projects is such an organisation. Alec has over 35 years accounting experience in industry and commerce. He has been regularly to Uganda since 1994. Alec has engaged in voluntary work in life skills, mainly with adults, for over 30 years. He has a real desire to encourage and help people to be all that they can be. Duncan has worked for many years in helping and supporting people with Disabilities into and in employment. He currently works as an Adviser for a large Disability Organisation. 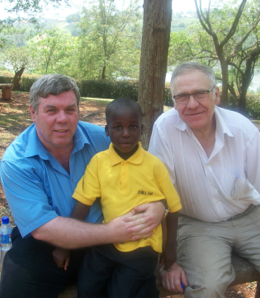 He is a member of St Peter’s Free Church of Scotland, Dundee and has visited Uganda on several occasions and is very supportive of Capstone’s work in Uganda. Andrew works as a doctor in Sheffield Children’s Hospital in South Yorkshire. He has visited Uganda several times and is involved with Living Water Medical Centre in Lugazi, where he undertakes a role with the staff there to share their vision of developing the clinic further. Andrew has helped develop a HIV facility within the clinic which provides free testing and treatment to patients in Lugazi. He has worked closely with the staff at Living Water including a 5 month residential visit. Joyce has worked in the public sector in Scotland for over 35 years. Initially working to help provide training and employment opportunities for young people and long term unemployed adults, she moved into a business development role some 25 years ago. Joyce is particularly keen to work with small early stage businesses and entrepreneurial individuals. She joined Capstone as a Director some months after her first visit to Uganda in February 2011 and is now a regular visitor to our projects in Lugazi. She has been heavily involved in the Woman’s Small Business Project and the Coffee Growing Project.